Did you know? Students who are engaged with campus dining on social media platforms believe they spend 32 percent more than their non-engaged counterparts. Marketing-savvy colleges and universities are using social media to boost meal plan and food sales across their campuses. 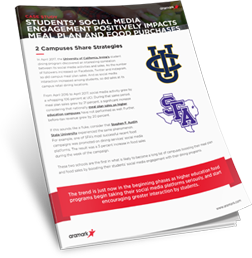 Find out how two institutions have found success and their best practices for engaging students on multiple digital channels.